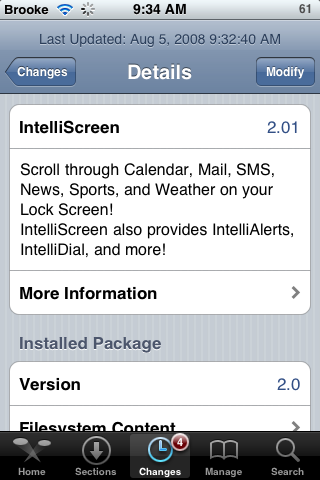 The update to version 2.01 of IntelliScreen just makes a few changes to the application. The two visual changes include the ability to choose alert sounds (see screenshots below) and an IntelliDial screen even if you do not have any Favorites selected. Now, if you press the Home button to go to IntelliDial and you do not have any Favorites selected you will get a screen that says, “IntelliDial uses your contact favorites. You have no favorite contacts.” There was also one bug fix that had to do with the app not starting. Other than that, no major changes. 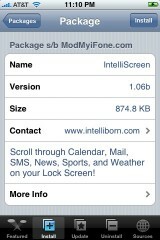 Though, I sure am glad to have IntelliScreen back! I really missed this app!! You can get IntelliScreen 2.01 in Cydia via the Intelliborn source. 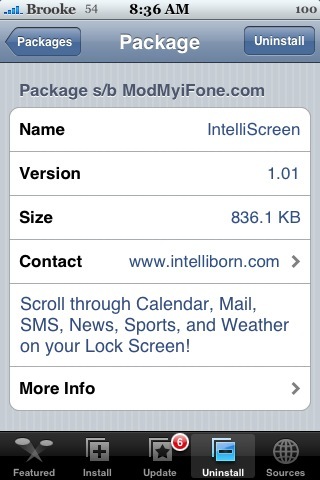 Ever since I updated IntelliScreen to 1.07 and 1.08, Kate has not shown up in my Settings. It took me a while to figure what was causing the issue with Kate, I finally realized it was IntelliScreen. 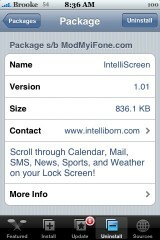 I personally am a huge fan of both Kate and InteliiScreen so, I was bummed that they were conflicting. However, thanks to a comment from JW, I found out that I could do some editing of my com.apple.SpringBoard.pist file and fix the problem! Well, I finally had a change to test it out and it worked great!! Here is what you need to do if you are having the same problem. 1. 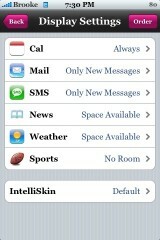 You will need to be able to SSH into your iPhone. 2. 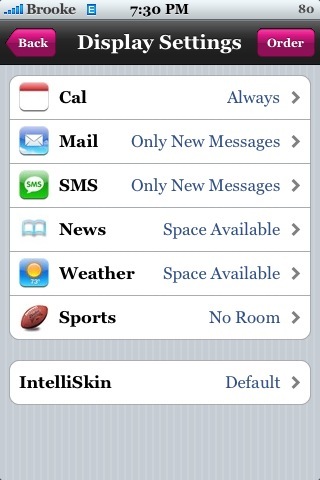 Find the com.apple.SpringBoard.plist file on your iPhone. It is located in the System/Library/LaunchDaemons folder. 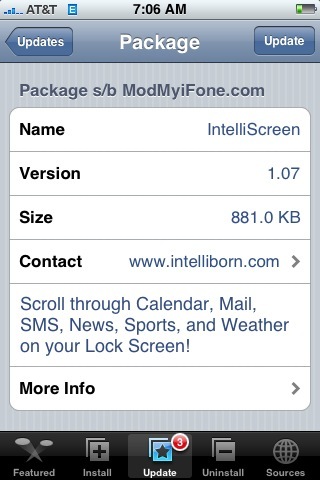 The update to version 1.08 of IntelliScreen makes a few bugs changes (see list below). 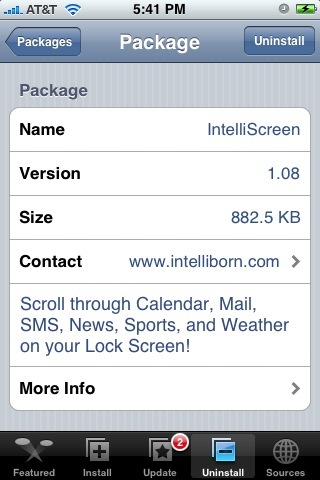 I am a huge fan of this application but, since they added IntelliDial…it has been driving me crazy! 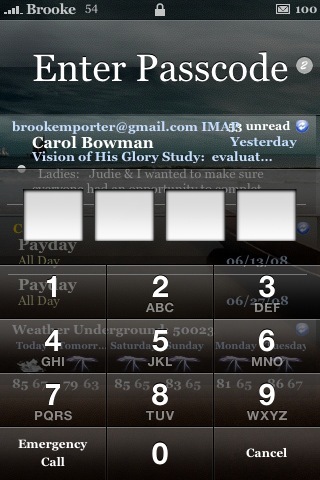 I normally press the Home Button to turn on my lock screen however, when I do, it now opens IntelliDial. Not only does IntelliDial take a few seconds to open, I then have to hit my Home Button again to get back to my lock screen so that I can slide to unlock. 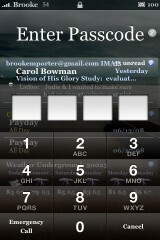 I wish there was a different way to get to IntelliDial or that it didn’t activate until your lock screen was awake. IntelliScreen is available through the Intelliborn source. 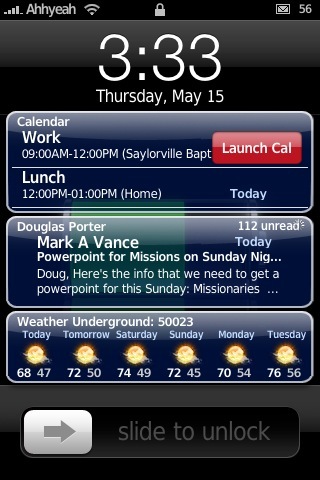 The update to IntelliScreen adds some very cool new features. 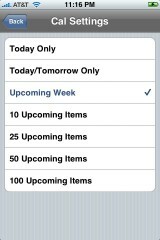 In the Calendar option on the main menu, you can now choose to view the Upcoming Week events. 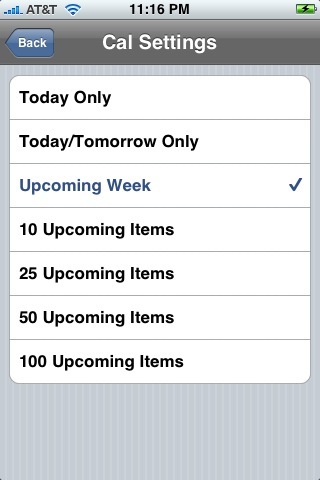 The Alerts option has also received some new features. 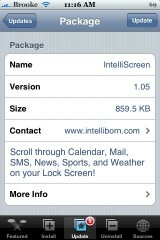 The update to version 1.05 of IntelliScreen just makes one small visual change to the application and fixes a few bugs. The visual change has to do with the Taskbar/Refresh icons…they are now little white refresh arrows instead of having a blue circle. 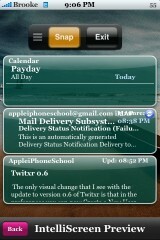 The bug fixes include; Battery usage when using Alerts, Default Dim Time when using the Home Button. IntelliScreen is available through the IntelliBorn source. With the release of versions 1.0-1.02 of IntelliScreen comes some very cool new features and some slightly disheartening news. Lets start with the cool new features. 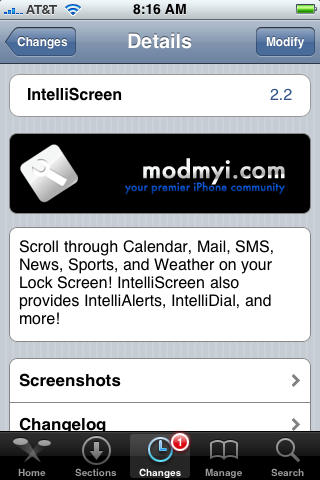 The new feature that I like the most is the ability to have two IntelliScreen pages. When on your lockscreen, you just tap the little 2 icon and it will flip over to the second page. To go back to the first page, just select to 1 icon. Another very cool new feature is that when you swipe on one of the options, it will have you enter your passcode before it launches the application. 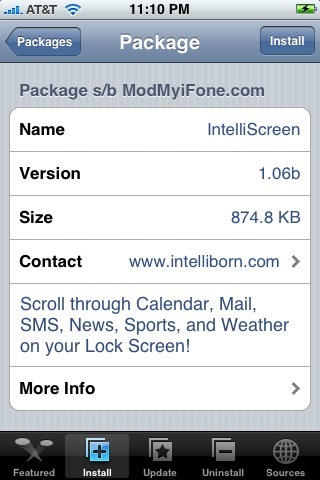 IntelliScreen is also no longer free. You get a 10 day trial and then after that, you must purchase a license which range from $4.99 to $49.99 USD (see information below). Here is a break down of some of the other new features. 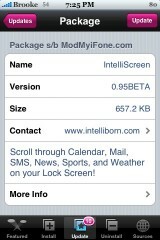 Below is the list of changes I noticed in the update to version 0.95 of IntelliScreen. 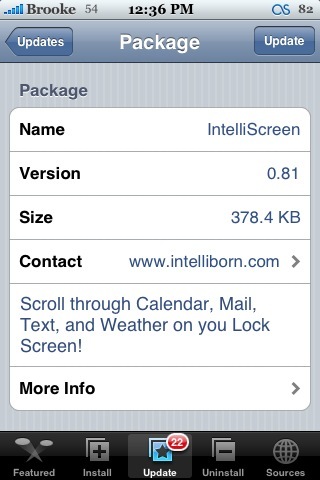 IntelliScreen is available through the Intelliborn source. 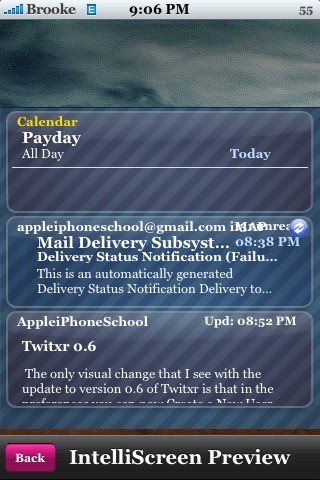 Main Menu – The Auto-Check Mail option does not show up unless you have Mail set as Only New Messages. The Mail Account Option has been moved into the Mail option, they are now longer seperate options on the main menu. New quick preview icon in the upper left corner (magnifying glass). 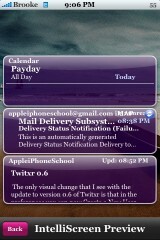 Just tap it to see a preview of what it will look like on your lock screen. Display Order – There is a new feature in Display Settings; IntelliSkin. 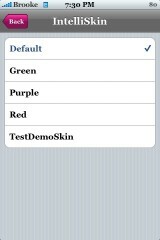 As for now, there are give options for skins; Default, Green, Purple, Red and TestDemoSkin.